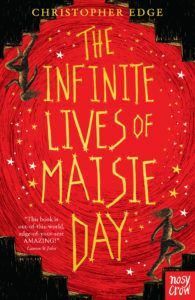 Infinite Lives of Maisie Day in-store and window promo pack – Bounce Sales & Marketing Ltd.
Nosy Crow are celebrating the release of Christopher Edge’s new book, The Infinite Lives of Maisie Day, with a glittering POS pack recreating the stunning cover art. Includes stars, window decal, metallic pen, posters and bookmarks. Request a pack and make your bookshop into a small inner-cosmos.